"I read in Psalm 115:16 that the heavens belong to God, and that He has given mankind dominion over the earth. Will God allow men to trespass into His heavens and travel to the moon?" The Bible reveals that nothing will be restrained" from man that he has imagined to do — unless God intervenes to stop him (Gen. 11:6). Since the time of Noah, men have continually rebelled against God. Now we see the great nations of this world locked in a frantic and desperate race to be first to the moon. Incomprehensible sums of money are being spent and millions of man hours are being plunged into a project in direct defiance of the Creator. Man is seeking to trespass in God's own heaven! But God is already intervening. Neither the U.S.S.R. nor the United States is able to meet its schedules because of financial crises. The Bible does not say specifically whether God will actually allow man to succeed in his mad race to the moon. But it does foretell that men will die in the attempt! Your Bible prophesies that human bodies will be scattered to the uttermost parts of the heavens! Read it in Deuteronomy 30:4. Man does not have the knowledge to cope with the many hazards — known and unknown — which confront travelers in space. Beyond the limits of the earth's atmosphere man is worse than a fish out of water. Even the slightest unforeseen difficulty can mean instant death! 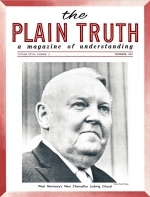 In June, 1961, The PLAIN TRUTH reported to its readers of the Soviet space experiments. Since that time, United States Government Intelligence has confirmed that possibly as many as five Soviet cosmonauts have been lost in the Communist effort to conquer space! It means that WE ARE NEARER THE END OF THIS AGE THAN MOST EVEN DREAM! God Almighty gave mankind DOMINION over the solid earth, the oceans, and the air — but NOT over outer-space. When men started to build a city and a tower to reach into the heavens, Almighty God stopped them! He did not stop them before they got well started. He allowed them to almost complete their dreams. He has allowed man to start once again — this time actually INTO outer-space. He will, undoubtedly, let man get a little farther. BUT NOT MUCH FARTHER! New experiments with human beings may soon develop. This time hapless men will be shot into space, as medical madmen seek to force human beings to exist in a foreign and forbidden environment. What will happen to those who perish in outer space? Jesus Christ promises He will gather the victims from the UTTERMOST PARTS OF HEAVEN when He returns to resurrect the dead and rule this world! Notice Deuteronomy 30:3, "That then the Lord thy God will turn thy captivity (our nations are going into national captivity in World War III), and have compassion upon thee, and will return and gather thee from all the nations, whither the Lord thy God hath scattered thee. If any of thine be driven out unto the OUTMOST PARTS OF HEAVEN, from thence will the Lord thy God gather thee, and from thence will he fetch thee." This same promise is repeated in Nehemiah 1:8-9. Not until this twentieth-century SPACE AGE has man attempted to propel his fellow man into the vast emptiness beyond the earth's atmosphere. These promises that God Almighty made over 4000 years ago could not have been fulfilled until our day today! Also, if you have not already received your free copy of the surprising booklet, "WHO Will Rule SPACE?," write for it immediately.